The International Year of Pulses celebrated in 2016 magnified the public focus and consumer perception on human health, environmental aspects, crop production and novel product development benefits of pulses. The gluten-free and plant protein movements have also increased interest in pulse utilization. The common dry bean (Phaseolus vulgaris L.) among pulses is the most economically and widest ecologically adapted crop species used for food by large populations. Nowadays, dry beans top the list of pulse crops accounting on average for ~38 and 32% of global pulse growing area and production, respectively. Protein production from kidney beans requires about 18, 12, 10, 10 and 9 times less land, fertilizer, pesticide, water and fuel, respectively compared to producing the same amount of protein from beef. This book focuses on breeding aspects including new cultivars, production and post-harvest practices, and investigations that can lead to the development of high quality grain and functional foods, and nutraceutical products from beans. It also provides an overview of the crop management practices, technology progress and impacts favoring the best possible clean and sustainable crop production. Bean breeding is highlighted form the European perspective including the preservation/conservation of local gene pools. Bean production and quality improvement is a continuous process, particularly in major bean producing and consuming countries. The socioeconomic impact is considerable in countries where beans are traditionally part of the staple daily diet. However, application of novel technologies in improving nitrogen fixation, integrated disease management, and post-harvest storage ensures sustainable bean production and quality. The quality of bean types close to the site of its original domestication provides an outlook on their resilience and potential as a genetic resource and future food products. Current knowledge of bean health benefits, bioactive compounds, bioactive peptides and phenolics are important for development of novel functional foods. Beans can be used in many forms; as a natural coagulant, in metabolic disease prevention and other common bean-based food products, where their current market availability is explored. The multiple attributes of beans including cost, sustainability, commercial availability in varied forms and types ensure its extensive and expanding use in the development of healthy eating habits that can reduce healthcare and societal costs. 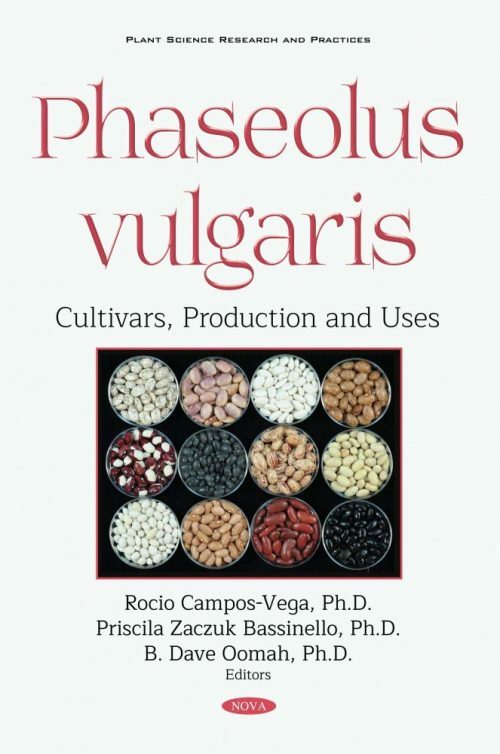 This book should give plant scientists, nutritionists, health professionals, chemists and industry professionals interested in beans useful and up-to-date information to advance the field. This book is of special use to plant scientists, nutritionists, health professionals, chemists and industry professionals interested in beans and its product developments.